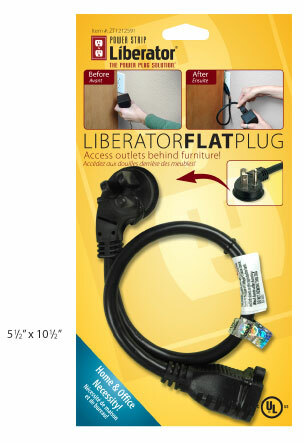 The Power Strip Liberator® Flat Plug cord makes it possible to connect devices, even bulky AC adapters, to outlets hidden behind desks and couches. Just plug a big bulky power adapter into a Power Strip Liberator® Flat Plug cord and then connect the Flat Plug cord to the available socket. The plug only protrudes half an inch (13mm), so you'll hardly notice the gap. These durable extension cords are built to last and meet or exceed all electrical code and UL requirements for safety.